Beautiful rare 3 bedroom corner unit in CityPlace South Tower in Downtown WPB. 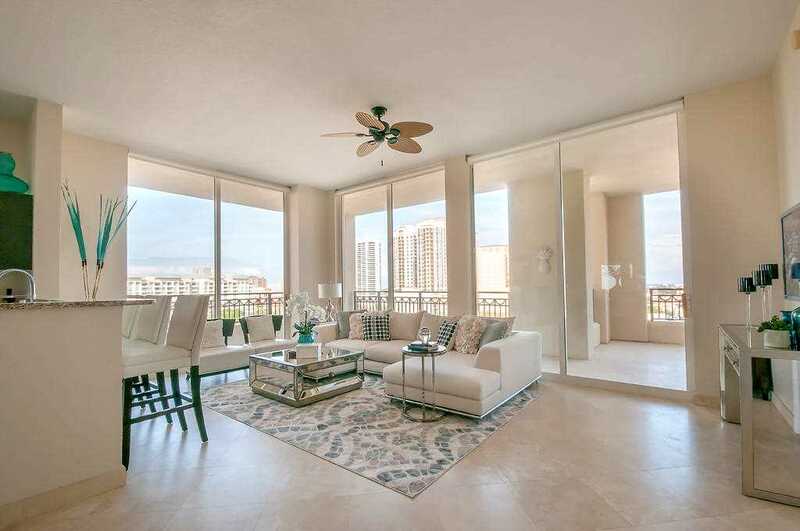 Huge wrap around balcony offers views of ocean, Intracoastal and city. Travertine flooring throughout living spaces and premium wood floors in bedrooms. Ceilings are 10' tall, same as penthouse floors! Kitchen is finished with dark Italian cabinetry, granite countertops and stainless steel appliances. Baths complete with marble vanities, spa tub and frameless glass shower. Has 2 parking spaces and storage unit included. Amenities include resort style pool deck with infinity pool, jacuzzi, summer kitchen, rainfall showers and wifi lounge areas, valet, concierge, event lounge, state of the art gym with kickboxing studio, sauna, steam, spa treatment rooms & more. Walk to CityPlace for shops, dining & entertainment. Directions:I95 East On Okeechobee. Building on right after convention center before Dixie Hwy. Valet Available. SchoolsClick map icons below to view information for schools near 550 Okeechobee Boulevard #902 West Palm Beach, FL 33401.